Presenting a draft of "Take It Outside! 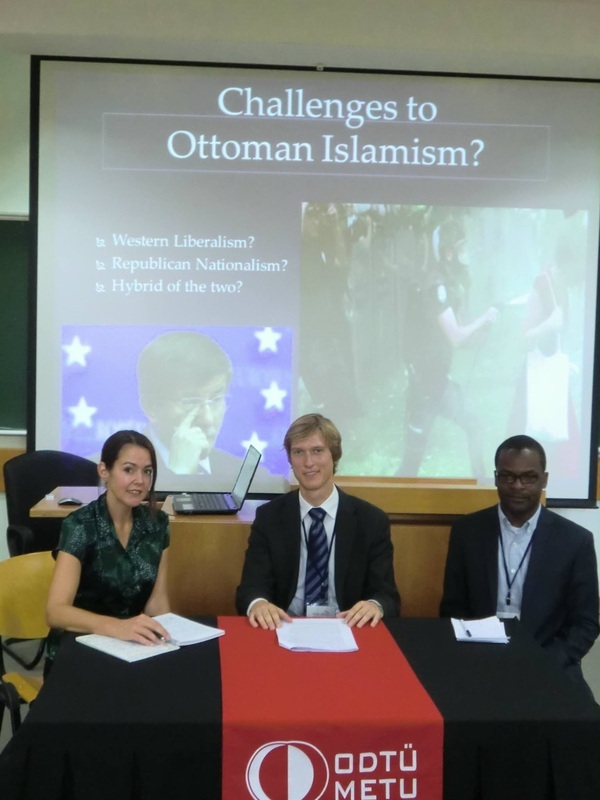 National Identity Contestation in the Foreign Policy Arena," recently published in European Journal of International Relations, at the 2014 World Congress for Middle Eastern Studies at Middle East Technical Institute in Ankara. Next to me are colleagues Moritz Pieper (center) and Octavius Pinkard from one of my alma maters, the University of Kent's Brussels School of International Studies. Identity Politics Inside Out: National Identity Contestation and Foreign Policy in Turkey. Forthcoming with Oxford University Press: expected 2018. "Rethinking Sticks and Stones: Interaction Effects of Opposition Satire and Government Insult on Protest Escalation Dynamics." "Pride, Prejudice, and Presidency: A Social Identity Theory Approach to Turkey's Kurdish Question." "(Red) Lines at the Polls: Theorizing the Limits of Far-Right Parties' Outreach and Appeal." "Parsing the Politics - Pop Culture Link: Tool of Regime, Resistance, and Researcher." "It's MY Party... Holidays as Sites of Minority Identity Contestation in Repressive Regimes,” with Allison Quatrini.